just up the pike: "if it works for kids, it works for everyone"
"if it works for kids, it works for everyone"
I'm currently trying out the ICC as I go home to East County for Thanksgiving. Posting will resume Monday, unless I get bored. If not, I'll see you next week. Happy Thanksgiving! 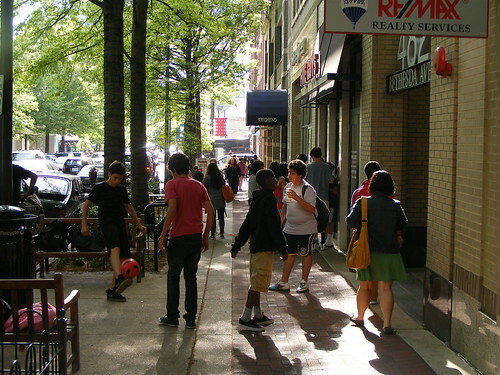 Kids goofing off on Bethesda Avenue in downtown Bethesda. We assume that kids belong in the suburbs, where they've got yards to play in and great schools to learn in. But it's not a foregone conclusion that good, urban neighborhoods can produce good kids as well. What do teenagers need? The ability to get around without a driver's license, for starters. A 15-year-old who can get around town on foot, on transit, or by bike or skateboard isn't just a convenience for their parents, who don't have to shuttle them around after school. They're given the tools for their own independence and self-discovery. So the ideal place for a teenager is probably a neighborhood with sidewalks and bike lanes, ample public transit, and schools, shops and hangouts located within close range to home. It sounds a lot like Takoma Park, Bethesda, or below-the-Beltway Silver Spring. Rockville, with its new town center and excellent bike network, isn't far behind. For a child, having increasing opportunities to navigate the world around them, explore, invent, fall down, scrape knees, make decisions, screw up, get into — and solve — conflicts and, ultimately, achieve a sense of personal identity and self-sufficiency is a good thing. The right thing. Of course, kids who can actually get around on their own two feet might do some unsavory things. Some of the kids who walk to downtown Bethesda, for instance, might've gone to buy drugs at the movie theatre on Wisconsin Avenue. But it's not like the car-bound kids in Germantown and Olney weren't doing that, and it's a lot harder to hide destructive behaviors when you're not in a two-ton vehicle. 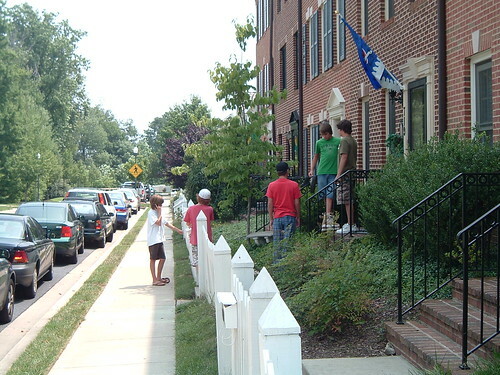 Kids talking on a stoop in Kentlands. The first time I was allowed to go anywhere by myself was at age eight, when my family lived in Georgian Towers in downtown Silver Spring. Given, I was only taking the elevator from our apartment to the lobby, but I was so excited I screamed the whole way down. Pretty soon, I could walk to my friends' apartments, across the street to Woodside Park, around the corner to 7-Eleven, and so on. This ended a few years later when we moved to Calverton, where there's very little within walking distance. But I still knew that I had the power to do things on my own. My twelve-year-old brother, meanwhile, has spent his entire life in Calverton. When he's not at school, he's at home playing video games, but I've noticed he doesn't have a close group of friends because they don't live nearby. Last year, I took him to walk with my former boss, Councilmember Leventhal in a parade in Kentlands, one of Montgomery County's few truly walkable neighborhoods. "Isn't this great, Tyler?" I asked as I took him around Kentlands' Main Street, where we could see kids ducking into shops and hanging out in a little green. "Kids your age who live in this neighborhood can walk to school, to friends' houses, and to the movies! Wouldn't you like that?" Tyler looked at me like I'd said the sky was green. "Why would I want to walk?" he replied. "Mom and Dad can just drive me there." Outside Blair High School on University Boulevard. Kids who have to walk in a place like this likely can't wait to drive. As a result, I tend to see most of the issues I write about, from better bike trails and infill development to skateparks and curfews, from the perspective of kids like my brother. I don't just think that good urbanism can make better communities. I think it makes better kids: confident, independent, and more aware of the world around them. We talk about how urban neighborhoods are drawing young adults and senior citizens alike. But they have a lot to offer kids and teenagers, as well. That's the great part about good urbanism: it can work for everyone, regardless of age or situation. I deeply regret raising a teenager in such a neighborhood, and can barely wait to get away from it myself. No place is "walkable" if the parents are too scared to let their kids out of their sight. Dan wrote (in a caption): Outside Blair High School on University Boulevard. Kids who have to walk in a place like this likely can't wait to drive. I disagree. I grew up in South Four Corners, not terribly far from "new" Blair and lived there from 1960 to 1985. 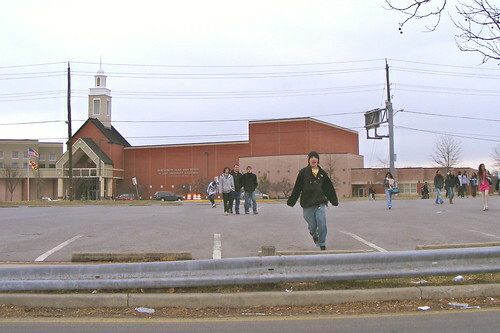 The Blair campus itself was vacant land for many years, starting in about 1959 or 1960, when land for an early section of the Capital Beltway (between Md. 97 (Georgia Avenue) and Md. 193 (University Boulevard East) was purchased by the State Roads Commission (predecessor agency to SHA) and cleared. The land on which Blair stands today was once the Indian Spring Country Club. Kids in the neighborhood called it "the Trails," though the planners at M-NCP&PC called it the "Kay Tract" for reasons I no longer remember. Four Corners generally is a pretty walkable area, even though most streets do not have sidewalks, because streets have relativeluy gentle grades (with a few exceptions) and traffic volumes tend to be low, with the notable exception of University Boulevard (East and West), which has always had sidewalks, but has always (in my memory) had heavy traffic and U.S. 29 (Colesville Road). In recent years, sidewalks have been built along Colesville Road, but it lacked them for many years, except in the business area of "downtown" Four Corners. But other than those streets, it's not a bad area to walk on the streets.